Elliptical galaxies, in contrast with spiral ones, have a simple shape, with a prominant nucleus, and a fairly wide halo around it. The brightness of such a galaxy quickly decreases from the nucleus to the edge. M87, an elliptical galaxy of class E0 in the Virgo cluster, 50 million light years away. It is a giant galaxy, which harbours more than 3000 billion solar masses. 50 million light years away. Elliptical galaxies are often small galaxies, with ten billion stars. Their brightness is quite low. Some of them, however, are really giant galaxies, one thousand times bigger. The flattening of the ellipse is not a consequence of the spinning of the galaxy, but comes from the uncoordinated orbits of the stars. The three axes of the ellipsoid can, in this way, have different lenghts. The flatter the ellipse is, the higher the number is in the classification, according to the formula n=10*(major axis-minus axis)/major axis. 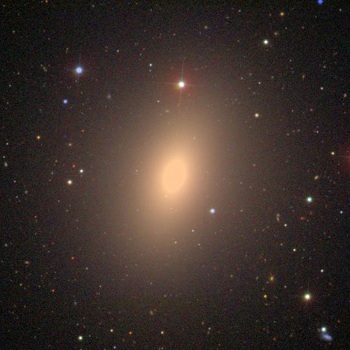 The observation of elliptical galaxies shows that, apart from the core, the amount of ultra-violet radiations - typical of young stars- is very low. Its stellar population is mainly of type II, corresponding to old stars. This observation shows that the lack of gas and dust between the stars is the limiting factor for the birth and formation of new stars. Lenticular galaxies, of type S0, have a disc shape with a central bulb as the spiral galaxies, but are closer of the elliptical ones, due to the lack of arms and most importantly the very low rate of star formation. an almost complete lack of dust and gas, hence the absence of young stars.